Dom’s random recipe challenge this month is to randomly pick something from our stashes of magazines, cuttings and pull-outs. He knows us so well; don’t we all have a pile of those lurking around somewhere, trying to attract our attention and making us feel guilty? In my more organised moments, I gather clippings and old envelope jottings and put them in folders – three in fact, one for sweet stuff, one for savoury and one for Christmas. Annoyingly, I haven’t got organised enough to have one for chocolate. However, I’m not as efficient as I’d like to be, so most of them are still lying about the house in various places or used as bookmarks. I was NOT going to embark on a mega house-clearance and recipe sort out week, so I put my hand into the file for sweet recipes, hoped for the best and pulled out ……. another apple cake recipe!!!!! I’d pretty much thought I’d done my bit for apples this month, but it was not to be. This recipe for Lord Lambourne Apple & Thyme Cake, came from an RHS Grow Your Own card that I think I picked up about four years ago when visiting RHS Rosemoor in North Devon. Anyway, I have plenty of apples from my mother’s tree, the use of thyme seemed interesting and I could easily add chocolate chips into the mix so I started peeling apples. Cored, peeled and roughly chopped 3 apples (Cornish cooker / eater variety). Placed apple in a pan together with 25g cardamom sugar, 25g unsalted butter and 1/2 tsp cinnamon and simmered for a few minutes until soft, but not broken. Creamed 125g unsalted butter with 125g cardamom sugar, 100g light muscovado sugar and the leaves from 3 sprigs of thyme. Beat in 3 eggs – one by one. Sifted in 190g flour (1/2 wholemeal, half white and including 1 heaped tbsp Mesquite powder), 1 heaped tsp baking powder and 1 tsp cinnamon, then mixed. Stirred in the cooked apples followed by 50g milk chocolate chips (40%). Spooned into a 23cm cake mould and baked for 50 minutes at 150C. Allowed to cool for a while, then turned out onto a wire rack to cool completely. Mixed 1/4 tsp cinnamon with 1 tbsp icing sugar and dusted this over the top. It’s very hard to tell as I have only memory for comparison purposes, but I think this might be the best apple cake I’ve made so far. It was totally delicious. Very smooth in the mouth, cinnaomony and toffee appley too. My only complaint was that the thyme was only just detectable. Oh well, six apple cakes down – at least as many to go! I don’t think we can ever have too many apple cake recipes. This looks great but I’m now extremely worried about my cut-out recipe stash glaring at me from the corner of the sitting room – 3 shoe boxes full…how does the man know….? Love the idea of the thyme in there, and the texture looks just perfect. Yum, looks lovely and juicy. Yum! Yum! I love adding unexpected ingredients such as thyme, this sounds scrumptious. I like the sound of the thyme too – it’s great to not just restrict them to savouries. How do you make the cardamon sugar – do you just grind a few pods and add the seeds to some caster sugar? Ooh thyme – very interesting. I’m going to have to give this a try! this cake really appeals to me but unfortunately i have never seen mesquite powder here in melbourne..is there anything you would recommend as a substitute? What a wonderful and unusual recipe. I’m always hoarding magazine pages, clippings and recipe cards too – really must get around to digging some out soon, especially if I can discover gems like this! Now that sounds interesting – never had thyme in a cake before. Can never go wrong with apple though…best…cake…ingredient….EVER! Johanna – I’m wondering if it’s the pre-cooking of the apples that gives this such a silky texture – it’s that or the mesquite powder! Victoria – I guess it depends how strong the thyme is – ours wasn’t very and the flavour was only faintly there. BVG – thank you, it has a really lovely smooth texture which makes it extra scrummy. A Trifle Rushed – it’s nice to be surprised – mostly! Grazing Kate – for cardamom sugar, I have a jar of sugar with a handful of cardamom pods which live there – just keep topping up with sugar every time I use some. A bit annoying having to sieve the sugar first, but it’s a small price really. I just love all the garden rooms at Rosemoor. Hannah – depends on the strength of your thyme – rather wishing I’d used more. Hazel – I just substituted mesquite for some of the flour. I’m experimenting with it at the moment. Little Loaf – yes funny how we cut things out obviously thinking they are worth making and then just forget all about. CC – even more than butter? I LOVE the name of the cake and it sounds delicious too ~ apple cakes are the goddesses of Autumn cakes and yours looks brilliant. That looks nice. I like the idea of thyme in an apple cake. linked over from dom’s! so surprised to see thyme in an apple cake! It looks gorgeous, I’m another apple cake lover so this sounds fab. I like the idea of adding the thyme too. Janice – the thyme really appealed to me too. Shu Han – thanks for visiting. The thyme is a very nice addition. 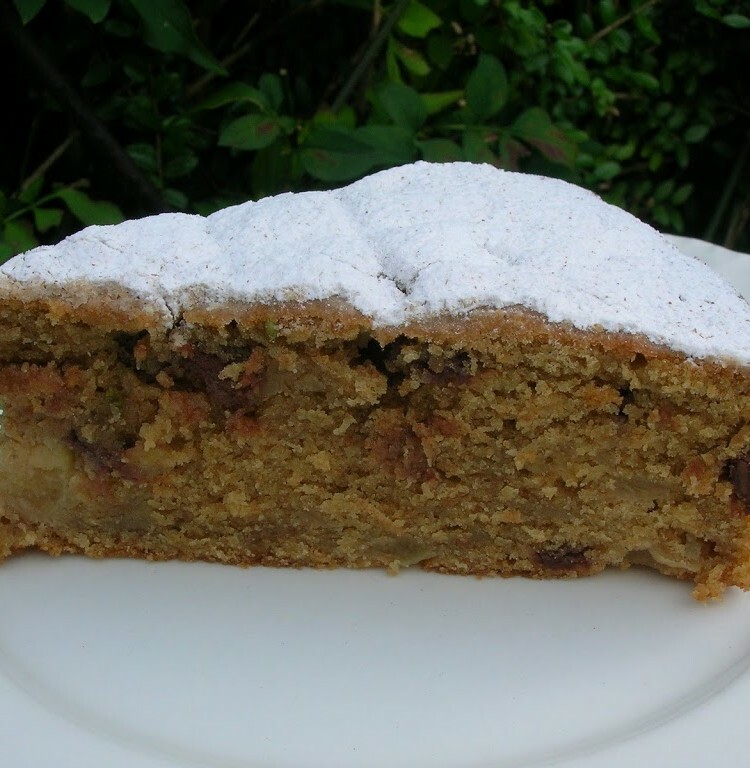 C – it’s certainly the season for apple cake and I expect I’ll be making one or two more before the season is out. Ruth – I thought this worked really well. I’m making this again next week for a party. This looks so lovely and moist, I love the addition of the thyme. I don’t use herbs enough in baking. Thyme is one of the few things I manage to grow in our garden, so it would be good to use it more often.